Migration can drive a gainful urbanization process, increase employment opportunities and rural incomes, restructure the economy and reduce regional disparities. While that may be true, the migrant population's working and living conditions remain markedly inferior to those of the resident population in receiving cities, and ensuring access to the social security system and basic public services has become a key challenge for the Government. In 2010, one out of every eight children in China was a migrant child, while one out of every four children in urban areas was a migrant child. Children who move with their parents generally lose their traditional and community support structures and face hardship and discrimination in their new environments. Many are not registered in their new residence, meaning their public service needs remain "invisible" to the local authorities. Not to mention, the separate and non-transferable health insurance schemes for urban and rural areas means that migrants and their families have inadequate health insurance coverage. Most left-behind children maintain limited contact with their parents and often feel lonely, isolated and deprived of support, with some seeing their parents only during Spring Festival. Their caregivers, 33% being grandparents, are frequently unable to provide adequate care and supervision, including emotional support, adequate hygiene and nutrition, sufficient guidance to prevent child injury and homework supervision. This has had a negative impact on their physical, educational and psychosocial development and well-being. - The healthcare system of the receiving communities should cover migrant children. - Efforts should be made to facilitate migrant children's education, like increasing enrollment in kindergartens, allowing migrant children to take college entrance exams and constructing boarding schools in rural areas. - A registration system for migrant children under 16 years of age and a sound service system for rural left-behind children should be established. 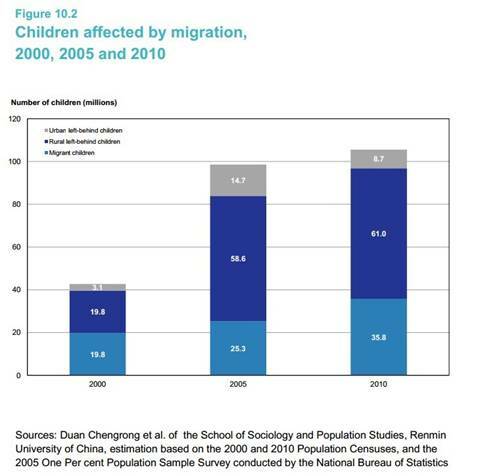 In 2010, 38% of all children in China were affected by migration, and left-behind children accounted for 40% of all rural children in China, while 87.5% of all left-behind children were rural.